11th Year Celebration of San Diego's Premier Bike Ride! 4 Fantastic Cycling Routes are offered for advanced to beginners riders with a King / Queen of the mountain challenge and bayfront after party. - San Diego's Favorite Cycling Event! Proudly Supporting Challenged Athletes Foundation - Operation Rebound! Southern California meets Italy in this celebration of cycling, food, and San Diego’s picturesque water front. 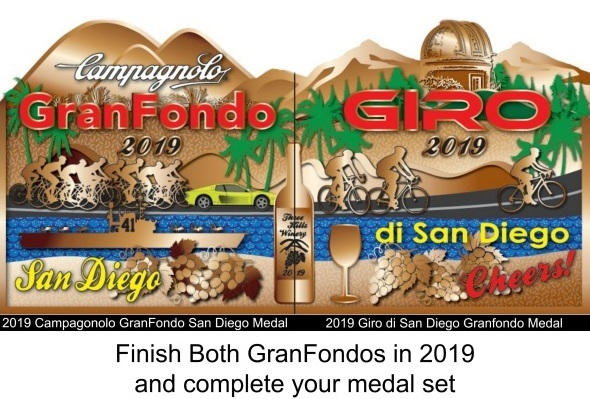 Held in beautiful Downtown San Diego, the two-day festival features a mass-start, timed Gran Fondo with 4 route options, timed King and Queen of the Mountain competitions, The Bike & Fitness Expo with guest speakers and bike, health and fitness clinics. Challenging and inspiring routes, outstanding Campagnolo ride support, delicious food on course, followed by an Itialian Feast at the Finish. The Party — You will be cheered into the finish line, awarded your medal, and ushered into enjoy the Fantastic Finish celebration with live music, bike valet, Special Guest speakers, Italian Pasta Fest, Beer Garden, and a well-deserved massage. Open to all levels of cyclists with 4 Route Options: 101, 60, 34, 20 Miles. No matter which your distance you choose, you will be Rewarded with the Full GranFondo Experience! ALL Merchandise will be available for pick up Saturday at the EXPO during packet pick up. Be A Guest Speaker - We will have featured guest speakers at the expo both days from our charity sponsor Challenged Athletes foundation, speakers from the San Diego Community, and Guest Athletes such as local cycling Olympic Medalist Nelson Vails. Nuun Hydration will be our Official Course Drink. Pulse Endurance Sports will be our Official Bike Shop. RAFFLE RAFFLE RAFFLE - Fantastic Raffle for Challenged Athletes Foundation - Operation Rebound at the EXPO. Buy your raffle tickets when you register on Active.com or on SATURDAY at packet pick up. Winners will be drawn throughout the day Sunday, check the board when you finish to see if you are a winner. You DO NOT Have to be present to Win. Order Your 2019 Event Jersey - and there are bibs, shorts, hats and arm warmers to match! BE A CAMPY VIP! - Do You Love Campagnolo, we Love you Back. Introducing the new"Riders Club Corral" - All Riders with Campagnolo equipped bicycles have a special place upfront - right behind the VIP Corral at the start of the Granfondo! You will be up front with the Yellow Ferrari, our CAF Athletes, and special Guest VIPS. - PLEASE come to the Campagnolo tent at the Expo on Saturday and they will give you a Campy Club Wrist Band to get you in the Club Corral. Please arrive to the Club Corral by 6:50 am our Campagnolo representative will check your bike and let you in. Raise Just $600 and Earn a FREE RIDE and Jersey! We are proud to supporters of Challenged Athletes Foundation's (CAF) Operation Rebound, sports and fitness program for American military personnel, veterans and first responders with permanent physical disabilities.